Screenshot Habbo News on mashable; klick to get there. Habbo recently reached the unbelieveble level of 100 Million users. 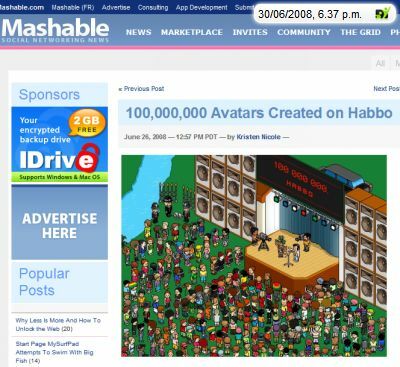 As mashable writes, Habbo is eight years old, but still, this an amazing and really impressive number! None other virtual worlds reaches this status; Habbo is followed by Neopets who have roundabout 50% of Habbos user counts, and the next vw as IMVU, Stardolls und Second Life.